You are viewing the archived 2016 lawn mower ratings. Follow the link for the current lawn mower ratings. Where can you find the best lawn mower for your garden? You can start by comparing brands with our customer satisfaction review and ratings. Canstar Blue research finalised in August 2016, published in September 2016. Breaking Honda’s dominance of recent years, Masport has risen to the top in the ratings for cutting your grass. Masport rated five stars in all crucial areas, including ease of use, reliability and quality of cut. Think of summer in Australia and the words barbeque, cricket and swimming come to mind because, as the weather warms up again, our attention turns back to our outdoor living space and gardens. This means regular mowing and general maintenance, trimming all those trees and hedges before your back yard starts to resemble more of a jungle than a lovely outdoor space for the family to enjoy. Take your eye off the ball – and lawn mower off the grass – for just a couple of weeks and you’ll be in deep trouble. Most of us know this all too well, which is why we can appreciate a top of the range lawn mower that is equally capable of battling those overgrown lawns as it is giving them a gentle reminder of who’s boss every weekend. So where can you find the best lawn mower? 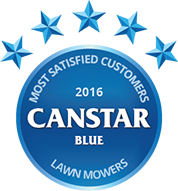 Well, every year Canstar Blue canvases the opinions of everyday Aussies to find out how they rate the lawn mower they currently own. We ask them to review their mower brand based on factors such as reliability and performance, quality of grass cut and ease of use. In the three previous years of our lawn mower ratings, Honda has proved a cut above the rest in regards to overall customer satisfaction. However, our 2016 award has gone to Masport – the New Zealand manufacturing company that has earned a glowing reputation in Australia as a premium brand of outdoor and garden equipment. Masport also achieved a creditable four stars in terms of value for money, so it seems Aussies are convinced that our cousins from across the ditch know a thing or two about cutting grass. What different types of lawn mowers are there? Our ratings are based on the feedback of adults who own any of these types of mowers, with brands generally providing most of them for customers to choose from. So let’s work out which type of lawn mower is best for your garden. Thanks to Masport for the images. Probably the type of mower your granddad uses, hand mowers are great for small gardens if you’d prefer a hassle-free mower that doesn’t require a power source (e.g. no long cords, fuel or battery). Hand mowers provide the ultimate convenience – you can simply whip it out of your shed and start mowing whenever you please. There is a downside however, as hand mowers will require more effort than their petrol or electric cousins. As the name suggests, you’ll be ‘mowing by hand’ and will get quite a workout – not necessarily a bad thing. This means they are best for short grass-cutting jobs! Definite plus points are that hand mowers are cheap to buy – with prices ranging from as little as $50 up to about $150 – and there will be no ongoing costs such as electricity usage or petrol. Electric lawn mowers provide a relaxing alternative to the hand mowers we just mentioned because your energy bill will do all the hard work for you. Electric mowers are typically easy to use and you can drift away into a daydream while your mower gets busy with the grass. However, you must keep your wits about you at all times because electric mowers come with an electric power cord, and one false move could land you in trouble. You also need to keep in mind that the power cord could get stuck around any trees or shrubs in your garden, which could present some issues. Overall though, there are probably more positives than negatives about electric lawn mowers. They are generally light-weight, easy to use and cheaper than petrol or cordless movers, with the majority costing around $150-$300. Cordless or ‘battery’ lawn mowers are similar to their electric brother, just without – you guessed it – the power cord! They still rely on the power of good old electricity to mow your lawn, but instead come with a battery that you pre-charge. This means no worries about running over the cord, or frustration of having to continuously move it out of your way. The potential downside to cordless mowers is that, once your battery runs out, no more mowing for you! This could make mowing an extra-large lawn a pretty long exercise, but the battery capacity of new models is improving. Whether they are worth the extra money or not will be up to you, with prices starting at about $400 and rising in excess of $650. Some people just love the smell of petrol on a warm, summer’s afternoon. But more than that, petrol lawn mowers can be the best solution if you have a large garden with particularly long or stubborn grass. With no power cords or battery life to worry about, petrol mowers can reach as far as you want, usually for as long as you want. However, petrol mowers come with two downsides – supplies and maintenance. If you don’t have any fuel left, your lawn mower will be going nowhere. Plus, you’ll have to get used to lubricating and tuning your mower’s parts to keep it working properly. They can also be quite noisy, so you may want to buy some earmuffs! The cost of petrol lawn mowers varies considerably, from as little as $400 up to more than $900. Our survey found that Aussies, who have purchased a new lawn mower in the last five years, spent an average of $615. That’s a lot of money – but the good news is they last for an average of almost 10 years! Masport is a name synonymous with outdoor power equipment and its wide range of lawn mowers is no exception. It produces hand, electric, cordless and petrol mowers, including the rather modestly named ‘President’ series and Silver series. These lawn mowers pack one hell of a punch, with prices – between about $350 and $450 – reflecting their features and performance. The hand, electric and other petrol lawn mowers come at a cheaper price. The Masport brand is also well-known for other outdoor appliances such as chippers, shredders and edgers. As we mentioned above, Masport received five-star reviews in most areas. Not many companies specialise in both motorcycles and lawn mowers, but Honda is one of them. A three-time winner of our lawn mowers award, Honda has a strong reputation for quality and high-performance mowers. It produces a wide range of commercial lawn mowers, but also has a more domesticated series to choose from, including electric, cordless and petrol models. You can expect Honda lawn mowers to cost more than the average, but you can also expect to get value for money. Honda rated four stars across most criteria, but also received a five-star review for grass-cutting quality. Ozito provides a large range of power tools and equipment for both indoors and outdoors. Interestingly, the brand doesn’t sell petrol lawn mowers, instead focusing its attention on a modest range of electric and cordless models, which generally come at the cheaper end of spectrum (i.e. under $200). Ozito is a bit of a one-step shop for all your power tools, also offerings blowers, chainsaws and line trimmers. Ozito was the only brand in this comparison to receive five stars on value for money, while recording four-star scores in every other category. The Rover range of lawn mowers is split into three different categories – push lawn mowers, self-propelled lawn mowers and cylinder lawn mowers. There are eight push lawn mowers to choose from, priced between $370 and $800. You can expect to pay a similar amount for one of Rover’s five propelled lawn mowers, while the two cylinder mowers cost well in excess of $1,300. As you can probably tell, Rover lawn mowers are for people who take their grass cutting very seriously. Rover was rated four stars in every research category. Lawn mowers are the flagship appliance of the Victa brand, which is well-known for a wide range of garden equipment, including blowers, edgers and trimmers. Its range of mowers is potentially the most extensive in this review, with different ranges for specialised dealers, hardware giant Bunnings, plus other dealers and retailers. Some of Victa’s lawn mowers come in at the cheaper end of the market, with one product costing under $200. However, you can expect to pay close to $1,000 for its top of the line commercial machines. Victa received five-star ratings for quality of grass cut and ease of use, with four stars in all other areas. The name Bosch is usually associated with household appliances like ovens, washing machines and dishwashers. However, Bosch is also a name synonymous with garden tools, particularly lawn mowers. Bosch lawn mowers come in the form of hand, electric and cordless models, with no petrol mowers. There are only six different mowers to choose from, so it’s a fairly modest range from Bosch. Nevertheless, the words ‘effortless’ and ‘powerful’ are used a lot from Bosch. Bosch received a mixture of four and three-star ratings from customers. Ryobi produces a wide range of outdoor power tools and garden equipment – easily recognisable because of its bright yellow branding. You can choose between petrol and electric lawn mowers, with the latter powered by a Subaru engine! Ryobi was rated three stars in almost every category. Which lawn mower should you buy? Our survey found that just over half of Aussies actually enjoy mowing the lawn (55%), while just 28% described it as their favourite household chore – if there is such a thing! So the message is that you should look for a lawn mower that you can count on to do a good job every time, is easy to use, and delivers the grass-cutting of your dreams. This year Aussies have rated Masport number one in these areas. Canstar Blue commissioned Colmar Brunton to survey 3,000 Australian adults across a range of categories to measure and track customer satisfaction. The outcomes reported are the results from customers within the survey group who have purchased and used a new lawn mower in the last five years – in this case, 746 people.